Mid-summer in far southeastern Virginia is not my favorite time to go birding or butterflying, or to take nature walks. Oppressi ve temperatures and humidity become unbearable and biting insects, snakes and ticks become more troublesome. I’m willing to put up with these annoyances when there is a lot of bird activity to witness, but not so much when things are slower, as they generally are in the summer (compared to spring and fall). Last weekend I went on a butterfly walk at Back Bay, a place I love in the right season, but on a hot, stagnant day in mid-July there were lots of people but very few birds or butterflies, and all I came home with was a bad sunburn and a mediocre photo of a Cottonmouth (above)! Don’t get me wrong, there is wildlife to see, and the occasional summer rarity passes through, but at this time of year, I tend to do more critter-watching in my own yard than I do out in the wild places. Over the last few years I have planted native plants in my yard that attract native wildlife, and honestly, I’m seeing more butterflies now visiting my yard than I see anywhere else. There are actually several species of Skippers that I have never seen anywhere except in my own yard. When you plant the right native plants in a concentrated area, you become an oasis in an otherwise biologically bare monoculture of lawns and non-native, exotic plants that do not sustain our native wildlife, and the critters will find you. And once they find you, they continue to return. I like to raise and releas e butterflies. I find the caterpillars in my yard, house them in screen cages, and feed them until they go into chrysalis. They stay in the chrysalis stage in the cage until they emerge as adult butterflies; then I release them into my yard. 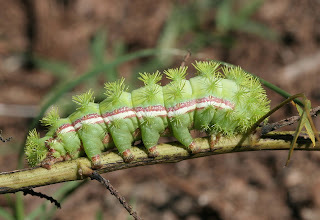 In order to get caterpillars in your yard in the first place, you have to know which native plants the caterpillars eat; caterpillars of each species eat only certain kinds of plants. So if you learn what these plants are and plant them in your yard, you’re likely to attract egg-laying adults. 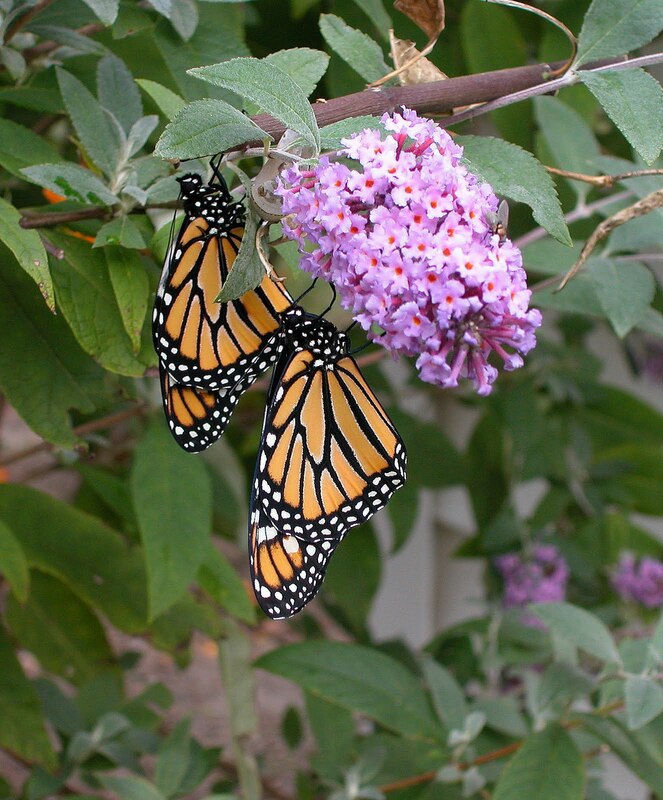 Butterflies cannot reproduce in the absence of the host plant that they are biologically bound to; that’s why non-native plant species cannot support reproduction of our native butterflies. So far I have raised and released well over 3000 individual butterflies. 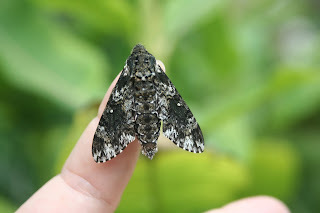 I have also had the pleasure in recent years of raising a few moths, which has been a real treat because the night-flying adults of most moth species are seldom seen by most of us and are therefore more “mysterious.” Some of them are also very striking, very large, and very fascinating to look at. 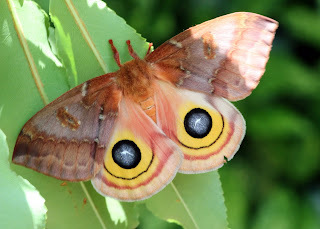 Moths have the same requirement that butterflies do; they each have specific native host plants that they must seek out for egg-laying and caterpillar food. Planting native plants has brought moths to my yard that I wasn’t even aware of before. Last fall I was cleaning up my yard and stumbled upon two Io Moth caterpillars, the first I had ever seen. I did a little research and learned that they eat Wild Cherry, so I collected them and fed them from my Wild Cherry tree. 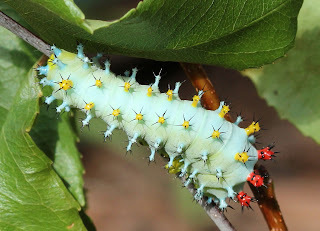 (By the way, Io caterpillars are famous for their sting, so if you see one, do not touch it directly). In the interest of full disclosure, I’ll admit that I did not find this caterpillar in my own yard — but I could have, because one of their host plants is Wild Cherry, which I have. 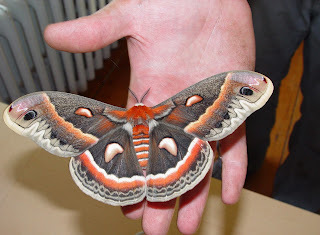 A fellow raise-and-release enthusiast had several Cecropia cocoons in a cage, and she was not at home when they emerged into adults. By the time she came home and found them, they had already mated and laid “hundreds” of eggs. I obtained one of the tiny caterpillars when it was no more than a quarter of an inch long, and started to feed it the Wild Cherry. Here’s its picture a few weeks later, when it was fatter and juicier; these guys get to be up to five inches long! Caterpillars go through several “instars between molts; in other words, they shed their skin when they outgrow it several times as they mature. In this photo, you can actually see the caterpillar’s shed skin in the upper right corner. What I found fascinating is that the shed skin includes the old spikes and colored balls that you see on the fresh caterpillar! Cecropias occur throughout eastern North America, west to the Rocky Mountains, but are seldom seen by most of us because they are active at night. I hope to find their caterpillars one day on my own Wild Cherry tree; I’ll be looking. I have raised and released around 150 butterflies so far this summer, but the peak months have not yet even begun. Moth and butterfly numbers will increase over the next two months or so, and I will be much busier finding and feeding voracious caterpillars, then experiencing the joy of releasing them as butterflies. Some will emerge this summer or fall, and some will actually overwinter as chrysalis in my cages and emerge next year. If you’re interested in knowing which native plants are hosts to which species, or would like any more details about the raise-and-release process, please don’t hesitate to contact me; I love sharing the knowledge! One of the most common themes in the Science Fiction genre is that of a future remnant of Mankind struggling to survive after a cataclysmic disaster. Countless books and movies have used this storyline.